Are you ready to try needle lace after reading my stumpwork embroidery page? 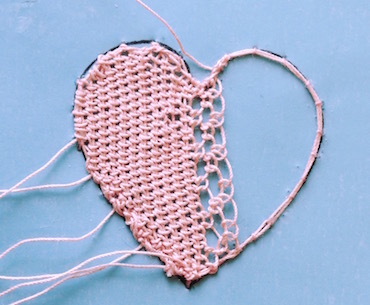 This simple heart project introduces the basic techniques of couching the outline of your shape (known as a cordonet), corded single brussels stitch and double brussels stitch. For your first needle lace project I suggest using either a tatting or crochet thread.. For the demonstration I used Fil a Dentelles from DMC, which is a size 80 thread often used for tatting. As you get more experienced you can use finer threads, for more delicate lace. In addition you will need a normal sewing thread in a similar color to your tatting thread for tacking your outline in place. You will also need 2 needles - a short pointed needle and either a ballpoint or small tapestry needle, which are both blunt. You will create the lace fabric with stitches, but in order to do this you will need to first create a needlelace pad.. For this you require a long rectangle of firm fabric, calico or muslin would work well. You need to fold this into three to create a base on which to work. On top of the folded fabric you need to place your paper pattern which is then held in place with either clear or blue sticky backed plastic.. The plastic prevents you from accidentally piercing the paper when doing your lace stitches. Cut a length of thread for the outline of your lace. Folded in half, this needs to be long enough to go around the entire shape. 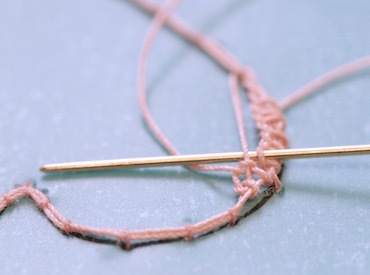 Thread your sharp needle with sewing thread and tie a knot in the end. This is a temporary thread and will not be part of your finished lace. 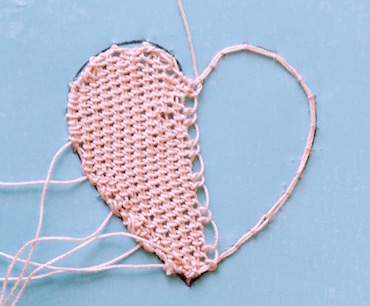 Start working half way down one side of the heart, by laying the doubled thread on the outline. Bring your needle to the right side on the outline and take it to the back inside the loop of folded thread to secure it. Stitch the cordonet in place, coming up on the outline, over the folded thread, and back down in the same hole. 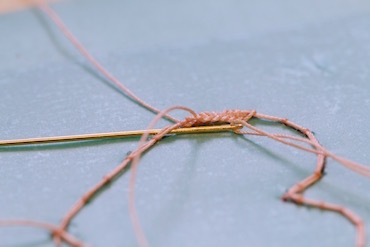 Keep these stitches close together (about 1/4 of an inch apart) to form a firm foundation for your needle lace. Work round to the point at the bottom of your heart in this way. Then thread your ballpoint or tapestry needle with one end of the outline thread. Slip the needle through the loop where the thread was folded at the start. This ensures that your lace won't fall apart when you are finished. 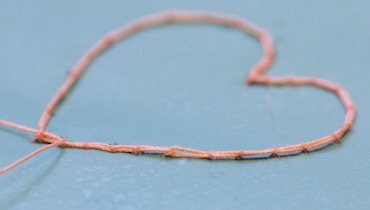 Lay the single strand back beside itself towards the bottom of the heart, forming a double outline as for the rest of the shape. Continue to use your sharp needle and sewing cotton to couch the doubled thread in place. Fasten off your sewing cotton on the back of the fabric pad when the outline is completed. Don't cut off the outlining thread ends at this point. We can use them later for buttonholing over the outline. From here on, your stitches will not go through the fabric pad at all. They will lay on the surface, winding through and under each other to form the lace. The corded single brussels stitch is the easiest needle lace stitch to learn, in my opinion. The important thing to keep in mind is not to pull your stitches too tight. Thread a length of tatting thread into the ballpoint needle. Secure this thread to the left side of your heart, just where it starts to curve for the top, by winding it through the outline a couple of times. Do not knot the thread. 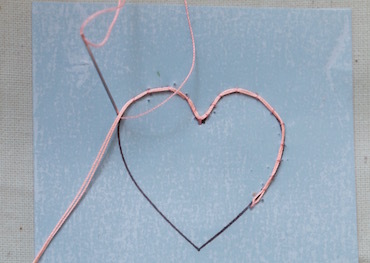 Next, slip your needle under the outline further up the heart, forming a long straight "cord" parallel to the side of the heart. This is shown in Fig 4. 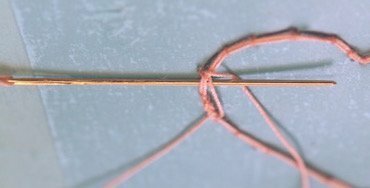 To begin your single brussels stitches, take your needle under the doubled outline, under the cord, and over the working thread. You are effectively making a buttonhole stitch. Continue working stitches in this way until you reach the outline. 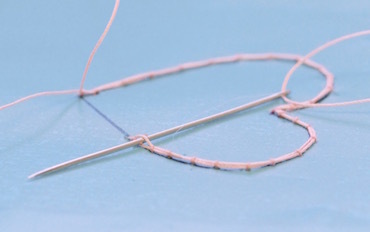 Take the needle between the double outline threads, to the outside of the heart, then slip it under both strands with the point towards the inside of the heart. Throw another cord across the shape and slip the needle between the outline threads again. Take the needle under the outline and over the working thread to create the first buttonhole stitch in your second row (Fig 6). By doing this you are increasing the number of stitches, and therefore the length of the row, as your shape gets wider. You will also need to do the same at the other end of this row. Now work your stitches by slipping the needle through the loops of the stitches in the first row, under the cord and over the working thread as shown in Fig 7. Continue in this way, increasing as necessary until the first half of your heart is complete. For the second half of the heart we are going to work without the cord to help us. At first you may find it tricky to get the right tension on your stitches, but the more you practice the easier it gets. This time we will work into two of the previous stitches, then miss two loops. This is continued across the whole row. Fig 8 shows the first row of double brussels completed. 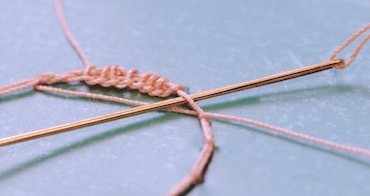 As before slip your needle through the doubled outline and then work in the other direction, putting two buttonhole stitches into the gap in the previous row, and then missing two loops. This will create a more open texture than the corded stitch we used for the first half of our heart. Continue to work rows until the entire heart is full. Catch your last row under the outline on the right hand side as you stitch. To finish off the edge of your lace you need to work close buttonhole stitches, with the corded edge to the outside. Work over any loose ends of thread that were left when you joined in a new length. When your needle lace heart is complete, turn over the pad and snip the couching stitches that were holding the outline in place. You will then be able to gently lift the lace off of the pad. Use small tweezers to carefully remove the sewing cotton ends from your lace. In addition to using your finished lace in a stumpwork project, you could embellish a crazy quilt block or garment with it. I hope you have enjoyed learning the basics of needle lace. You might want to try out my spring daffodil next or learn about the history of the craft..